Bite-Sized: King’s Court | Wake up, Meeples! Playing an action once and playing it three times for the cost of just one action are very different in power level. 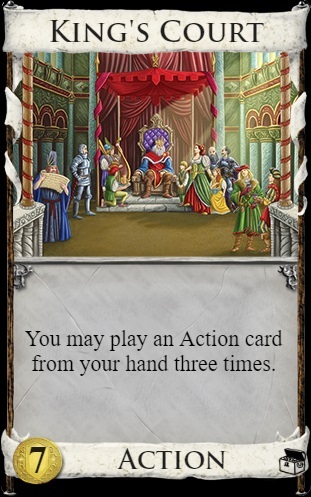 King’s Court’s effect on other action cards is already extremely strong for most actions in the game — for two cards (King’s Court and target action) you get the effect of three card plays. Things start getting absurd when you play King’s Court on King’s Court, though. Using the analogy from above, King’s Court on King’s Court allows for three tripled actions, which is nine card plays for five cards, which is more efficient as more King’s Courts are tripled. Turns that start with two King’s Courts and any source of +Cards are usually extremely good since you can draw your deck and use remaining King’s Courts to triple payload cards.